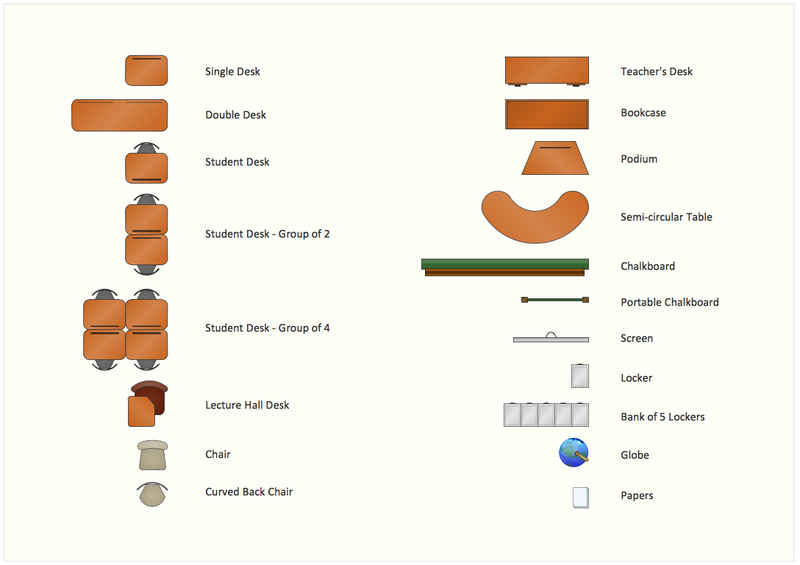 The vector stencils library School layout contains shapes of school furniture and equipment for ConceptDraw DIAGRAM diagramming and vector drawing software. Use it to draw school interior design floor plan, furniture and equipment layout of classroom or training office. These design elements libraries are included in School and Training Plans solution from Building Plans area of ConceptDraw Solution Park. Solution Building Plans from ConceptDraw Solution Park provides vector stencils libraries with for drawing School and Training Plans. Use ConceptDraw DIAGRAM diagramming and vector drawing software enhanced with Building Plans solution to draw your own floor plan, design, furniture and equipment layout of School or Training Office. You need design the Classroom Layout for the school, high-school, university? Now it's incredibly easy to do this in ConceptDraw DIAGRAM v12 software which was supplied with School and Training Plans Solution from the Building Plans Area. Office design must to be well thought-out. It is especially important for the small offices, where each detail is in sight. ConceptDraw DIAGRAM v12 software offers you the Office Layout Plans Solution from the Building Plans Area for quick and easy creating detailed Small Office Design plans. This sample was created in ConceptDraw DIAGRAM v12 diagramming and vector drawing software using the UML Class Diagram library of the Rapid UML Solution from the Software Development area of ConceptDraw Solution Park. This sample shows the structure of the building and can be used by building companies, real estate agencies, at the buying / selling of the realty. This sample was created in ConceptDraw DIAGRAM v12 diagramming and vector drawing software using the UML Class Diagram library of the Rapid UML Solution from the Software Development area of ConceptDraw Solution Park. This sample describes the use of the classes, the generalization associations between them, the multiplicity of associations and constraints. Provided UML diagram is one of the examples set that are part of Rapid UML solution.